The Wiggles, if you are not aware, are four guys who all wear brightly coloured sweaters (in fact, if you ask me, they look like extras from the background of the original series of Star Trek). Together they sing and dance their Wiggly songs for the pre-school market. As well as the four guys (Greg, Murray, Jeff and Anthony) their TV show also features Dorothy the Dinosaur, Wags the Dog, Henry the Octopus and Captain Feathersword the friendly pirate. 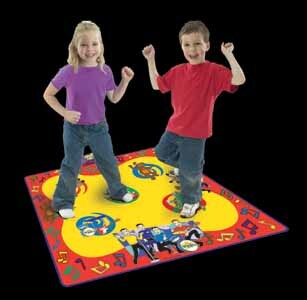 The Wiggly, Wiggly, Dance Mat is a great addition to the Wiggles range of musical toys. This mat is manufactured from good quality stain resistant material, which allows you to wipe it clean - in case there are any little food related accidents. 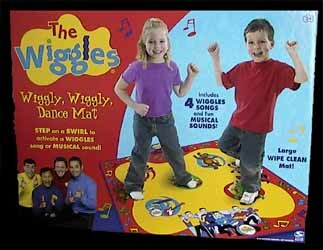 The mat comes with four groovy songs (Dancing With Wags the Dog, Dance the Ooby-Doo, Move Your Arms Like Henry and Toot Toot Chugga Chugga Big Red Car), as well as nine fantastic musical sounds. While the four songs may become a little too repetitive after a while, you always have the option of playing your own choice of music for your little ones to dance to, or letting them dance on the mat while the Wiggles programme is on TV. In an age when most of our children don't get enough exercise, it's great to see that there are products on the market that will get them up and moving about - and tire them out so that you can get them off to bed early.